I am working on updating this page. Check the Links Page for links to other sites. See the News Page for up-to-date information. Jacqueline appeared on a stamp all by herself, issued by Somalia. in "Bullitt". Part of a sheet of Hollywood Couples. This site (formerly called "BiteSite") contains several interview clips (using "Real Audio"). They have added 9 new clips, from an interview about "Dangerous Beauty", in addition to the 6 older clips. They also have a very small picture of her and a some minor biographical data. If you explore their site, they have lots of multimedia from many movies. Jacqueline was seen briefly on the E! network's show, "Roman Polanski", one of their "True Hollywood Story" shows. Jacqueline could be heard (but not seen) narrating Impressionists on the Seine on PBS last year. AMC Salute to Film Noir: I caught glimpses of Jacqueline in the audience of this show on American Movie Classics that aired on December 1st, 1997. The December issue of "Inside Kung-Fu" magazine has this small black&white photo of Jacqueline with her companion Emin Boztepe and some other martial arts masters. This was pointed out to me by a Jacqueline Bisset fan who is a student of Emin Boztepe (there was a website that included more information about him and his school, but it is down right now). Jacqueline was in Montreal for the Montreal World Film Festival (Festival des Films du Monde), Aug. 22 to Sept. 2, 1997, where she is president of the "official film jury". You can read the Press Release, which includes a short bio, and has links to more info about the film festival. Another Montreal Film Festival page, with info and a few pictures of Jacqueline. Jacqueline was on the jury of another film festival, in France. If you check her page at their site, you'll see they "borrowed" some of my scans. They also give a link to my old site. Another fan reports that she and her husband met Jacqueline in the Pushkin Fine Arts museum in Moscow. In her words: "[Jacqueline] was there for the Moscow International Movie Festival along with Robert De Niro, Jeoffrey Rush and Sophia Loren. I have to tell you she is even more beautiful in person, with the body of an eighteen-year old.... She was very nice to us and gave us an autograph.... By the way she is even more popular in Russia than she is here." Jacqueline was also at the Argentine Film Festival; this site includes a couple of pictures of her. 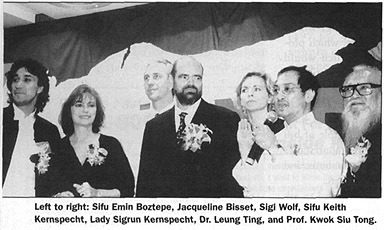 The 1996 AFI Fest Report includes a picture of Jacqueline. And another picture here. Apparently Mike Myers (of "Wayne's World" fame) (and/or Mike McCullers?) is a Jacqueline Bisset fan. The a tie-in book, Austin Powers: How To Be an International Man of Mystery, by Mike McCullers, has a section entitled, "Top Ten Birds, Then and Now" (that is, 1967 and 1997). The only woman to make both lists is Jacqueline Bisset! See the Links Page for more links. According to some 1970s movie magazines, Jacqueline is 5' 6 1/2'' tall. In an episode from the 14th season, "Large Marge", the Old Sea Captain (Captain McAllister) sings "You're like Jacqueline Bisset in my favorite film, 'The Deep.'" This was 25 years after the movie's release. Have you felt a shadow of its pain? I thought of you in Clifton in the rain. 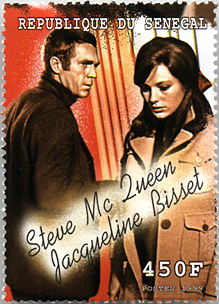 In "Cul-De-Sac", Jacqueline played a character named "Jacqueline", but was billed as "Jackie Bisset"; in "Two for the Road", she played a character named "Jackie", but was billed as "Jacqueline Bisset".